Checked out some property outside of Lit (Jämtland County) today. Good fishing waters nearby etc. In the end it wasn´t for me but some day I will locate the place of my dreams. They had this on their land, another artistic interpretation of the Great Lake Monster. You have little things like this all over the place in these parts. Took this snapshot down by the Great Lake (Storsjön) in Östersund (Jämtland County) today. They have built a few fortresses of ice for the kids and on this you can see Storsie (the Great Lake Monster) check the visitors out. I can appreciate the fact that they put so much love into a project like this. Every kid around here will be exposed to this mystery very early on. Holiday on its last few days here. I have not travelled at all this year, not even a concert (and I could have seen Deep Purple and Black Sabbath had I wanted to!). And I like it. Instead I have been taken it easy here in Jämtland County (Sweden), one of the most gorgeous places on this earth. So I opted to do another trip on the old trusted bicycle today in good company, and our goal was to check out the island of Frösön in Lake Storsjön (The Great Lake, home of Storsjöodjuret, The Great Lake Monster). Now this is where I grew up, part of this island is like part of town, but with a couple of bridges separating Frösön from the town of Östersund. Then you have a large mountain and on the other side of that an airport. Used to be part military, part civilian but it is all civilian now. Did my stint in the Air Force there back in the day. But this part of the island also has a beautiful church and some areas out back with incredible nature that people never see. That was the goal, to check out the area we had never seen, and to have a good day in the sun taking a few snapshots on the way. Took this shot of an outdoor bath (what you see here is only a small part of it) that has closed down now, so this will soon be gone I suppose. What a pity, I mean the kids can certainly appreciate a place like this. I used to spend a lot of time there as a kid, and I have to admit that I was unaware of what this place looked like now. This homage to The Great Lake Monster (or Storsie) came as a bit of a surprise. Glad to capture it on film while it still stands. Once we arrived on the furthest point of the island, we headed into the woods towards the shoreline. Soon there was only a thin trail that was pretty hard to move through but we did so anyhow and boy was this a great decision. A deer passed us by very close. Fantastic nature, lovely cottages by the lake with grand views for miles and miles. I guess we spent a couple of hours checking it all out and at my age (55) it started to get a little rough. All in all we spent nearly six hours on this little trip and it was brilliant. On the way home I wanted to buy some beverage at a hotel and guess what, they did not accept cash. This civilization is clearly going to hell. Still, great day and I do feel lucky to have so much so close to where I reside. I think these snapshots says it all. I attended the annual Great Lake Monster (also known as Storsie) Conference tonight, and this year it was held in my home town Östersund (Jämtland County). The Conference is moved to hamlets and towns around Lake Storsjön (The Great Lake) and this was the first time I ever visited a meeting close to where I reside myself. 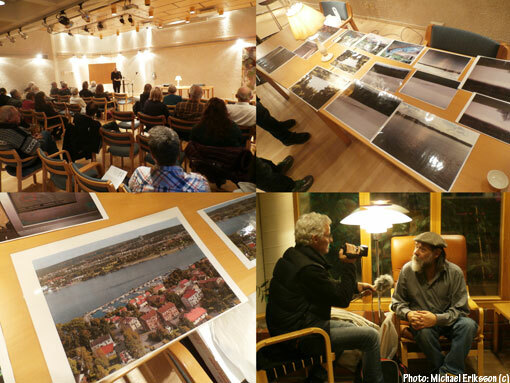 I guess about 50 people turned up, we had about 10 witnesses telling their stories (I was one of them) and local media was there to cover the event – the journalist filmed a few interviews, I showcase one image here (bottom right) in which witness Anders Ek recalls his experience with something unusual in this lake when he was a kid (the story can be found on this blog). Photographs was on display and all in all it was a good night. Föreningen Storsjöodjuret (roughly translates to The Great Lake Monster Association) is doing a fine job. Got this in the mail the other day, Odjursbladet 1 2015 (translates roughly to Monster Newsletter), and we´re talking about the regularly printed membership newsletter of Föreningen Storsjöodjuret (Great Lake Monster Association), still going strong after all these years. It´s a 4 page affair, with the latest sightings of The Great Lake Monster (also called Storsie), and the goings on of the Society. I thought that it could be fun for you guys to see this, and that this really is an ongoing thing. 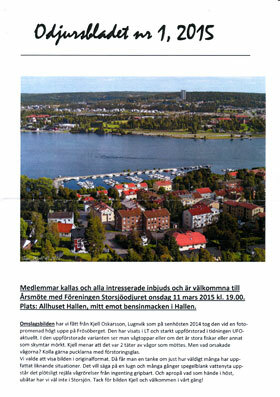 The image at the front of this newsletter was taken by Kjell Oskarsson last Autumn from the mountain at Frösön (the Island located opposite the town of Östersund), and it´s one of many strange photographs taken in this lake (Storsjön – The Great Lake) over the years. Is it just two waves meeting creating these movements in the water on this image, or did Kjell catch something else? We´ll never know. It´s quite interesting though, isn´t it?